The reasons include aesthetics, functionality and flexibility. Physical Vapor Deposition (PVD) has been gaining traction in the appliance industry as a multifaceted raw material option. It offers aesthetic and functional benefits that many other materials can’t match. As such, appliance designers have become increasingly aware and interested in the possibilities of using PVD in their components. These possibilities include a broad range of coloring options along with anti-fingerprint and in some cases anti-microbial applications. PVD is most often referred to as a coating, but it is actually more of a surface treatment. 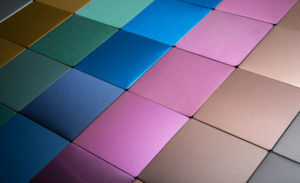 Instead of adding a substantial layering to a surface such as paint, PVD physically binds a compound to the surface at the micron level. The process alters the physical properties of the metal surface with an extremely minute buildup. In fact, the very thin layer of material is deposited and becomes a part of the metallic surface itself. Surface aesthetics and functionality are improved by controlling time, temperature, and inert gas, along with a sacrificial metal such as titanium, all combined in a vacuum environment. Varying those elements within the vacuum atmosphere will achieve a particular and repeatable look, color and thickness of the application. 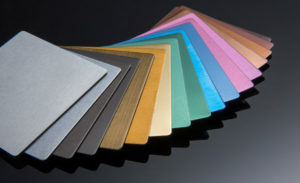 PVD can be supplied in sheet form as well as post part coloring to finished parts. This can be important because if you weld extensively, it’s important to blend the heat affected zone. While you can blend “texture,” it is difficult if not impossible to blend color. Thus post-fabrication welding can be fully dressed for the finish and then colored to achieve a pristine part. While there are advanced welding and joining techniques, the ability to apply PVD on a completed part opens up a lot more flexibility to the designer, especially for complex shapes. Like most trends, the higher-end appliances and kitchens usually lead the way and as the cycle grows, the usage is expanded to a broader scale. The stainless steel look or gourmet kitchen started the whole trend, and addition of color is just another evolution of that concept. PVD has long been used in architectural design and conveyance (elevator, escalator), and now sees a greater utilization in the appliance industry which could result in new developments in adjacent applications such as furniture. The ability to coordinate appliances with a certain aspect of lighting and furniture has great appeal. When you start looking at appliances, you can easily see the possibilities for backsplashes and different components that also can be coordinated as possible accent pieces. It brings a whole different level of flexibility to decorating, particularly when textured stainless steel, custom brushed stainless steel, and patterned stainless steel can be colored. The key issues for designers and manufacturing engineers are formability, bendability and material integrity without cracking. For samples, you can start out by going online and doing a little bit of research. Once you have the metal in hand, you can start testing it and applying it to various design and service parameters of the unit or part. Start with a simple visual concept for testing and make sure the surface achieves the same standards as the bare stainless steel currently in use. Then, as you put it through various levels of performance testing, other functional considerations can be factored in. Branding considerations can come into play as well. The whole process usually begins with aesthetics and moves to functionality.